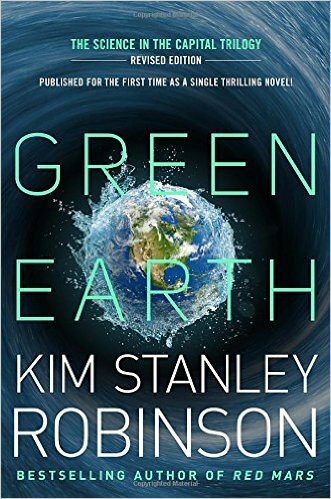 GREEN EARTH – Kim Stanley Robinson (2015) | Weighing a pig doesn't fatten it. Enough is as good as feast. Green Earth is a revised version of The Science In The Capital-trilogy, a near future series on climate change, American politics and science. The original trilogy consists of Forty Signs Of Rain (2004), Fifty Degrees Below (2005) and Sixty Days And Counting (2007). They were meant to be one long novel all along. In movies, most director’s cuts are longer, but not here so… Robinson cut about 300 pages, still leaving Green Earth to be a mammoth of 1069 pages. It’s unclear how much updating took place, if any – there’s about a decade of extra research and data on climate change since the first volume was published, so it’s not unthinkable that KSR tinkered a bit with some of the data in the original books too. You can read the 6 page introduction of the book on io9 here. It is an excellent text by KSR himself on the reasons for this revision, and he tackles some other interesting topics too. His take on the ethics of contemporary literature & science fiction is bold, and rings very true to these ears. Also, my original idea had been to write a realist novel as if it were science fiction. This approach struck me as funny, and also appropriate, because these days we live in a big science fiction novel we are all writing together. If you want to write a novel about our world now, you’d better write science fiction, or you will be doing some kind of inadvertent nostalgia piece; you will lack depth, miss the point, and remain confused. I’ll start with some remarks about the book in general, and afterwards zoom in a bit on the 3 parts. I should probably mention that I made about 7 times as many notes while reading as I do for most reviews. Some of that is surely on behalf of the 1000+ page count, but still. Green Earth is an extremely rich book, and this review should have been at least twice as long to do justice to the scope of its ideas: I’ll leave a lot unsaid. So, don’t forget to read the book too! Green Earth is set in Washington D.C. in a not so distant 21st century future: conservative radio talk show host Rush Limbaugh (°1951) is still active, and the book features several Vietnam veterans that are very much alive & kicking. Reading that list of themes might leave readers with a couple of wrong impressions. One. While Green Earth – as the bulk of KSR’s other books – is extremely well researched, and obviously features a lot of scientific stuff, it mainly is a book about characters and their lives. Not that many characters even. The cast is rather limited: there’s about ten important characters, with a focus on just two of those. There’s Charlie Quibler, a White House staffer with two young children, and Frank Vanderwal, a scientist from San Diego who works at the National Science Foundation. I cared about every character. They all have depth, they all are real persons, and none are too obviously flawed-as-a-token like in the work of lesser writers trying for complexity. But, all that doesn’t make Green Earth a 100% success on the character front: there’s one major quibble which I’ll point out when I get to Fifty Degrees Below. Two. While that list of themes I quoted is extensive, it lacks what maybe is Green Earth‘s most important theme: America. Green Earth is one of the great American Novels. Simple as that. It his heavily steeped in American history, American thinking and American literature. And while Green Earth is definitely a book about the climate systems of our entire planet, it focuses almost solely on what climate change means for America: catastrophic extinction events in China are mentioned, and a disastrous flooding of Prague too, but that’s about it. That’s not critique by the way: I think it’s one of this book’s many strengths that it doesn’t try to be all-encompassing. It is no secret that Kim Stanley Robinson is a progressive thinker. People who have watched his great 2011 talk Valuing the Earth and Future Generations: Imagining Post-Capitalism on YouTube (it’s over an hour) will find a lot to recognize in Green Earth. The book’s both nuanced and broad analysis of the faults of the political and economical system faults is dead on and scorching. Most readers of KSR’s work probably don’t need convincing on climate change. As such, this book could be accused of only preaching to the choir. And while that may be true, it also misses the point. As Robinson himself hints at in his introduction (“fiction doesn’t have to come true to make it useful”) still has an ethical “use”. As I experienced it, the purpose of Green Earth is to offer hope. Robinson is an optimistic writer – not the easiest choice in these cynical times. That alone deserves applause. It is all too easy to become depressed reading the papers – this week alone I came across 3 pretty alarming articles on that state of our biosphere in a mainstream newspaper. It is also easy to become afraid watching the ever widening rift between the “two Americas”, and the economical system’s dysfunctions are becoming obvious in Europe too. The myth of apathy is a real danger. While Green Earth doesn’t offer quick fixes or a naive silver bullet solution to Earth’s problems, it does sketch hints of a possible future in which humanity will get on the right tracks eventually – but not without the loss of an enormous amount of biodiversity: the coral reefs have all died in the book, and polar bears have gone extinct. We can all use a bit of realistic hope, even need it. Green Earth supplies in that need. It is very much a novel for this day and age: a hopeful call to arms. Robinson’s optimism echoes a feeling I have held for a long time myself: I’m pretty pessimistic about humanity’s near future, but I am a hopeful optimist about the long run. Just look at what giant steps we have made (both bad and good) the last 400 years – science and rational thought have proved to be helpful, and will continue to do so. Green Earth is a solid and convincing defense of the scientific method. Its main message is probably this: the sciences should urgently get involved in politics. Green Earth might be preaching to the choir, but it enhances the choir’s awareness nonetheless. It sharpens existing insights, refreshes theory, adds stuff you didn’t know, deepens the understanding. It’s a feast for the inquiring mind. Before I zoom in, a bit about those 300 cut pages. I didn’t miss them. On the contrary. I think KSR should have trimmed a bit more. At times Green Earth was repetitive, I hate to say. Somewhere between page 500 and 800 it had me bogged down, it truly dragged. 300 pages more of that might have worked when the 3 parts were published separately, with some years in-between reading, but read cover to cover even this trimmed version was work. 850 pages would have been better than Green Earth‘s 1069. Still, Robinson’s prose is extremely readable, light and clear throughout, funny at times. It might seem easy, but it’s a stunning feat not a lot of writers achieve. This first part was my favorite and introduces all the characters and themes nicely. There are some brilliant scenes – one with a plethora of animals (just as in 2312 by the way) and an obvious but well executed reference to Noah’s flood: humanity paying for its sins. It has a bit of a focus on sociobiology: Robinson is an evolutionary author, and he understands and describes humans as mammals coming from the savanna really well. For those of you who’ve read scientists like Frans De Waal it’s not new stuff at all, but it’s cleverly inserted in fictional literature here, and that makes for pleasant, insightful writing. What surprised me most is that Forty Signs Of Rain is also a compassionate book about being a young father. Maybe most of all – the extreme weather stuff only starts in the last 50 pages. Charlie Quibler works mainly by the phone from home, raising his toddler Joe, while his wife Anna works long hours as a scientist, lactating into plastic bags. It’s all heartfelt and moving. One feels Robinson writing from experience: I doubt it that somebody who hasn’t raised children could have written this. I had to think about The West Wing tv-series a couple of times. Really good stuff, nothing but praise. A bit of a shame KSR didn’t keep it on this level throughout the entire book, but then again, he makes for hard competition with himself. The second part focuses nearly solely on Frank Vanderwal, the scientist at NSF. His story is for the most part interesting too, and through it Robinson manages to insert his love for climbing and the outdoors. As he has said elsewhere: we should strive for “the paleolithic pleasures, plus modern dental care”. It becomes clear that Green Earth is about the things Robinson loves: science, climbing, family. Still, part 2 is exciting for the most part, and has beautiful, lyrical passages. Robinson is a nature writer too. Frank and the heron stood attentively, listening to unseen smaller birds whose wild twittering now filled the air. The heron’s head cocked to one side. For a time everything was still as bronze. Fifty Degrees Below is a love song to the human body as well. It made me rethink things. Eleven million bits of data per second were taken in at the sensory endings of the nervous system, he read. In each second all these incoming data were scanned, categorized, judged for danger, prioritized, and reacted to, all continuously, second after second; and at the same time his unconscious brain did all that, in his conscious mentation he could be singing with the birds, or focusing on a throw, or thinking about what it meant to be under surveillance. Parallel processing in the parcellated mind, at speeds ranging from nearly instantaneous to months and years, if not decades. As all great authors, Robinson manages to make us look at the world with new eyes. He doesn’t even need metaphors for this, he just describes things as they are. Take flying. Dulles to L.A. to Tokyo to Bangkok to Calcutta to Khembalung; for two days they lived in long vibrating rooms in the air, taking short breaks in big rooms in the ground. Ultimately, part 2 of Green Earth is about the social roles we play as individuals. Throughout the novel Robinson – again, as all great authors – displays a keen, sharp insight in group dynamics and interpersonal relationships. We all play different roles and nobody knows us fully, resulting in existential loneliness at times – Frank is a tragic character – yet we need to be whole. Here Buddhism kicks in, as a monk explains at the very end of this part. With it Robinson adds yet something else to the moral appeal of his big book. This third part again features the full cast a lot more, but it’s fair to say Frank stays the main character. Most narrative threads are neatly tied together, and in the end we leave all the characters with a feeling of optimism. I earned that, after 1069 pages. Instead of a summarizing conclusion – if you’ve come this far, you must have been able to guess my feelings on this book – I’ll end the review with the Thoreau quote the final chapter of Green Earth starts with: yet another hopeful call, another invitation. Even a miniature road map! And we went to heaven the long way round. This entry was posted in Reviews and tagged 2000s, 2010s, CliFi, Fifty Degrees Below, Forty Signs Of Rain, Green Earth, Kim Stanley Robinson, Review, Science Fiction, Science In The Capital trilogy, Sixty Days And Counting, The Capital Code. Bookmark the permalink. Excellent review! You’ve made this sound very tempting. Believe it or not, I still haven’t read anything by KSR, (despite your previous recommendations). So many books, so little time. Red Mars is on my reading horizon as it’s a BSFA winner. If you had to be strict and recommend only one KSR novel, which would it be? Thank you! I haven’t read the Mars trilogy myself, but it’s a favorite of lots of people, so I don’t think you can go wrong with that. From what I have read I’d say Aurora – that was the best book of 2015 imo. I reread the trilogy some time ago and I liked Fifty Degrees Below best. Interesting that you say that section makes the book drag in places. I’ve been wondering if I should read this edition. Do you think it would be worthwhile for someone who has read the original three volumes? I felt a drag in the second half of FDB and the first part of SDAC, I should have made that more clear. I don’t know if you need to read this: if you liked the original trilogy enough to reread that, I think this edition is obviously safe too: nothing is added, KSR himself speaks about cutting away verbosity to achieve a smoother read. But a third read, I don’t know… My feeling is that this edition is indeed smoother than the original, but that’s just based on a hunch. I guess reading the 3 books separately with other books in between is also an entirely different reading experience than a 1000 page book. But if your reread was the three books in a row, than you have more or less already had the same experience.